Tag line: "The Laugh Special of the Age. See It"
1926’s The General is considered by many to be Buster Keaton’s finest film (and for good reason: the movie is a bona-fide classic), but the truth of the matter is that ol' "Stone Face”, as he came to be known, turned out dozens of excellent pictures, all showcasing his distinctive blend of action and comedy. Steamboat Bill, Jr. is a prime example of the silent comedian doing what he does best, with plenty of sight gags and some impressive stunt work to boot. Keaton stars as William (Bill) Canfield Jr., son of Bill Canfield Sr. (Ernest Torrence), captain of a decrepit old steamboat named the Stonewall Jackson, which patrols the waters of the Mississippi. Having not seen his son since he was a baby, Bill Sr. is convinced the boy will be every bit as tough and rugged as his is. Unfortunately, Bill Jr. is frail and slight of frame, a far cry from what Bill Sr. was expecting, which is a shame because the elder Canfield is in dire need of some extra muscle. A new, state-of-the-art steamboat, owned and operated by tycoon John King (Tom McGuire), is driving poor Bill out of business, but instead of helping his father reclaim the river, Bill Jr. falls in love with Kitty (Marion Byron), King’s daughter, which neither Bill Sr. nor his rival are happy about. But when tragedy strikes, young Bill proves to everyone he has what it takes to be a hero. Considered (along with Chaplin) one of silent cinema's greatest comics, Keaton was also a master of precision. The scene where he first steps on board the Stonewall Jackson, all decked out in a Captain’s uniform, has a number of funny moments (when he accidentally knocks the ship’s life preserver into the water, it sinks like a stone), but the real excitement comes towards the end of the film, when Bill Jr. is battling hurricane-strength winds to save both Kitty and his father. It’s here that Keaton truly shines, allowing himself to be tossed around like a rag doll by the raging cyclone as he narrowly dodges peril at every turn. An exciting, nail biting sequence, it also features what is arguably Keaton's most famous scene, when a huge wall comes crashing down around him (the actor was in very real peril while this was being shot; if he missed his mark by so much as a foot, he would have been killed). 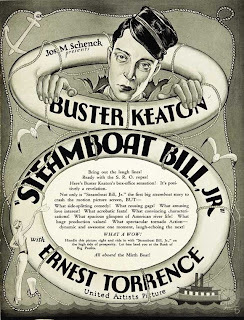 An action-packed movie with plenty of laughs, Steamboat Bill Jr was the perfect showcase for Keaton’s unique talents, featuring the comedian at his death-defying best.